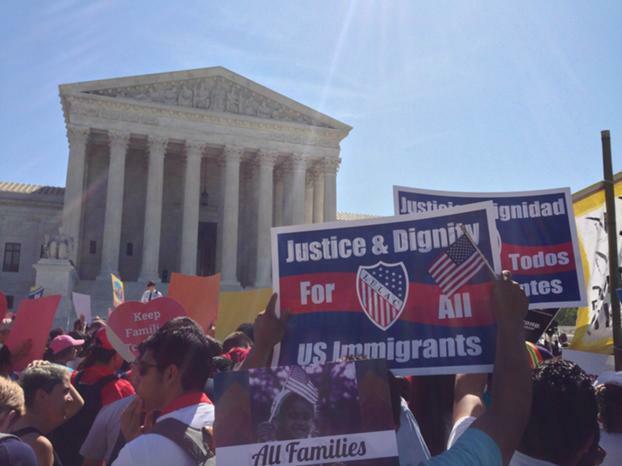 Thousands of immigrant justice advocates rallied in front of the U.S. Supreme Court Monday as the court heard oral arguments in U.S. v. Texas, the most important immigration case in decades. The lawsuit led by Texas and joined by 25 other states and congressional Republicans, challenges the constitutionality of the Deferred Action for Parents of Americans and Lawful Permanent Residents (DAPA) program and expansion of the Deferred Action for Childhood Arrivals (DACA) program, two key immigration policies enacted by President Obama in 2014. Implementation of DAPA would protect nearly four million immigrants – those who have been in the country since 2010 and have children of American citizenship or permanent residency – from deportation and grant temporary work permits. An expanded DACA would widen eligibility requirements and increase the number of beneficiaries of the program, which also protects immigrants from deportation and grants access to education and work authorization. A few thousand people spilled from the sidewalk onto the street outside the Supreme Court. Supporters of DAPA and DACA chanted the rallying cry, “keep families together,” a reference to parents and children of undocumented status who have been deported, resulting in families being split apart. Unions, grassroots campaigns, and advocacy organizations, including LULAC, were all on hand at the rally. Ju Hong of the advocacy organization, National Korean American Service & Education Consortium (NAKASEC), recently reunited with his family in South Korea for the first time in 13 years because of DACA, and wants to ultimately see comprehensive immigration reform. Inside the courtroom, justices allotted a total of an hour and a half to hear arguments, a deviation from the usual hour given in most cases. The plaintiffs argued President Obama’s policies go beyond his executive power and against Congress, while the federal government said the policy does not grant citizenship and lies within the President’s constitutional power. One of the key points of contention is whether DAPA grants immigrants lawful status. Areli Zarate, a teacher from Austin, Texas and beneficiary of DACA, said that because the policy does not grant permanent residency, her work permit and status in the country can be taken away from her at any time. Stakes were high when Thomas Saenz of the legal civil rights organization, the Mexican American Legal Defense and Educational Fund (MALDEF), presented arguments on behalf of three immigrant women eligible for deferred action under DAPA, the only party offering perspective on the human implications of the decision. Nancy Vega of New Jersey, an undocumented immigrant and mom of three, one with U.S. citizenship and two protected by DACA, said DAPA would allow her to get a better paying job and more income to put her children through college. The court is expected to rule on the case in June. If the case results in a 4-4 split, due to the current absence of one justice, a previous appellate court ruling would keep the policies frozen, but would not set court precedent. The Mexican American Legal Defense and Educational Fund (MALDEF) hosted its 2016 Latino State of the Union Address Thursday in Washington D.C., where panelists from leading civil rights organizations, including LULAC, discussed the implications of the upcoming Supreme Court case, U.S. v. Texas. The pending court case will rule on President Obama’s two key immigration policies, Deferred Action for Parents of Americans and Lawful Permanent Residents (DAPA) and the expansion of the Deferred Action for Childhood Arrivals (DACA). Thousands of immigrant justice advocates are expected to rally at Monday’s hearing in support of the policies. Thomas A. Saenz, President and General Counsel of MALDEF, said that by representing “intervenors”, three mothers from south Texas eligible for deferred action under the DAPA program, MALDEF has introduced a new perspective into the challenge, one that focuses on the human implications of the decision. “It’s important that the people’s voice be heard and that’s what MALDEF will be presenting on Monday,” Saenz said. The Court will rule on the constitutionality of President Obama’s administrative actions on immigration that expanded the DACA program and created DAPA. DAPA would protect nearly five million undocumented immigrants from deportation and allow for temporary work permits for those who have been in the country since 2010 and who have children of American citizenship or permanent residency. Expanded DACA would protect undocumented immigrants from deportation and grant permission to work and access to education. Panelist Gaby Pacheco, an immigrant rights leader and Program Director of TheDream.US called DACA a game changer with respect to how it has opened doors for undocumented immigrants to receive access to healthcare, driver’s licenses, in-state college tuition fees, housing, and more buying power. The panel further delved into issues regarding the Latino community, such as the Latino vote’s impact on this year’s election cycle, voter suppression, the widening wealth gap caused by the 2008 recession, and mass incarceration and criminal justice reform. Brent Wilkes, LULAC National Executive Director, spoke on the organization’s work to register eligible voters, particularly in caucus states such as Iowa. Wilkes noted 13,000 Latinos voted in the Iowa caucuses, compared to only 1,000 in the 2008 election. LULAC surpassed its goal of 10,000 voters (Iowa’s Latino population is 5.6 percent) with a ground campaign consisting of 700 volunteers, mailings, phone calls, and trainings to teach Latino communities what an actual caucus looks like, which Wilkes credits for helping familiarize Latinos on how to caucus and actually participate in the election. Susie Saavedra, Senior Director for Policy and Legislative Affairs at the National Urban League Washington Bureau, highlighted how the 2008 recession had a more threatening impact on Latino and African American communities, saying that it wiped out 20 years of gains in three years for both the Latino and black communities. The median wealth for white families is 10 times greater than it is for Latinos, according to a report by the Pew Research Center. On education and criminal justice, Saavedra also commented on the “school to prison pipeline ” that disproportionately impacts black and Latino students the most through school suspension and high dropout rates. In addition, she highlighted another disturbing phenomenon developing in Latino communities, the “school to deportation pipeline ”. She explained that in Orange County, where youth deportation in California is the highest, the probation department in the county was requiring probation officers to share data regarding youth student arrests with Immigration and Customs Enforcement (ICE). Prior to the conclusion of the event, Saenz spoke again on the importance of Monday’s U.S. v. Texas case.